This post is the fourth and final in a series on the characteristics associated with financial performance of Illinois grain farms from 2005 to 2009. The first two posts in this series (available here and here) examined the characteristics of grain farm operations with consistent performance over the 5-year time period ? or farms which were in the top and bottom quartiles for management returns in each of the 5 crop years. The third post (available here) shifted focus towards performance on an annual basis ? or what characteristics could be identified for grain farms earning management returns in the top or bottom 25% in any given year from 2005 to 2009. Today’s post focuses on crop yield and price levels across operations falling in the top and bottom quartiles for each year, and also provides some summary remarks based on what this series of posts has revealed. The averages and figures reported in today’s post are from the same farm-level data set provided by the Illinois Farm Business Farm Management (FBFM) Association used throughout this series. Financial performance is measured by management returns, with the farms grouped by quartile in each individual year. Management returns are equal to gross revenues less direct (i.e. seed, fertilizers, pesticide and herbicide), labor, power (i.e. utilities, fuel, machinery), building, and land costs. Figure 1 shows the average management returns for the top quartile (blue), bottom quartile (green), and all farms (red) from 2005 to 2009. The years chosen include two years of large average management returns (2007 and 2008), and three years of moderate to low average management returns (2005, 2006, and 2009). 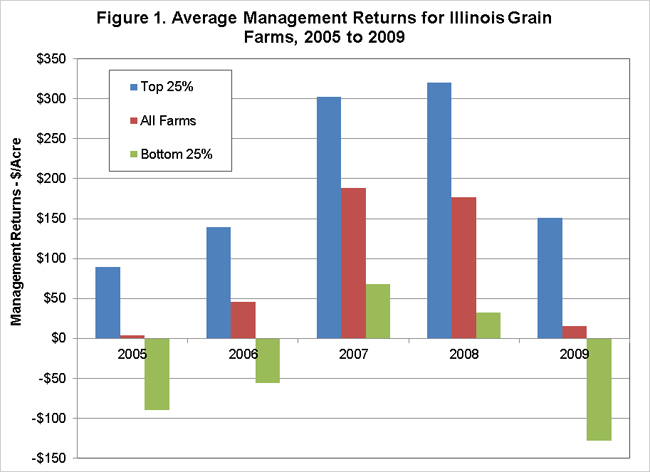 The difference in average management returns for farms in the top and bottom 25% increased from approximately $180 in 2005 to more than $280 in 2008 and 2009, illustrating a general increase in return variability over time. While the average level of returns fell in 2009, the variation in returns stayed comparable to that of the variation in the higher average return years of 2007 and 2008. 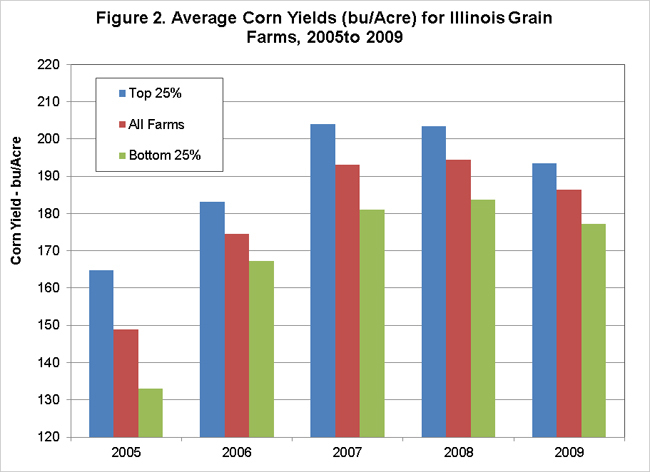 Figure 2 shows the differences in average corn yields across the top and bottom performance groups compared to all farms. The average yield difference across farms in the top and bottom performance quartiles ranged from 16 bushels/acre in 2006 and 2009 to more than 30 bushels per acre in 2005. In percentage terms, these yield differences ranged from about 9% (2006 and 2009) to more than 20% (2005). Figure 3 reports the differences in average soybean yields across performance groups. The difference in average soybean yields was the smallest in 2006, with just 3.3 bushels/acre separating farms in the top and bottom performance quartiles. This yield difference was more than 6 bushels/acre in all other years, and nearly 7 bushels/acre in 2005. 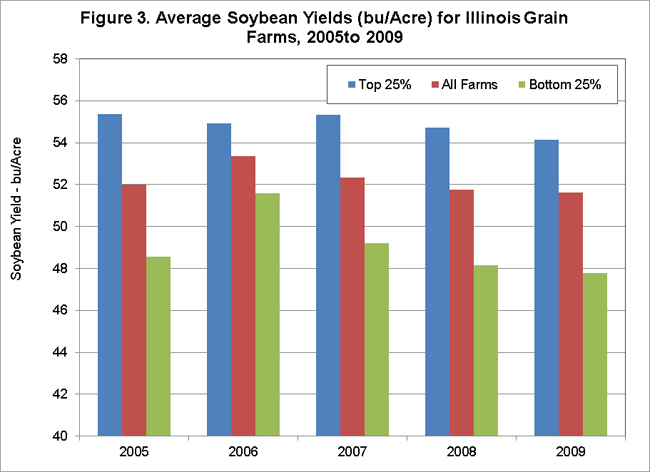 In percentage terms, the average yield difference between farms in the top and bottom quartiles ranged from 6% (2006) to 12.3% (2005), with the average soybean yield differences being more stable over time than for corn in both bushels/acre and as a percentage of all farm yields for each year. Figures 4 and 5 illustrate the differences in new crop prices received by farms in the different return performance groups for corn and soybeans, respectively. 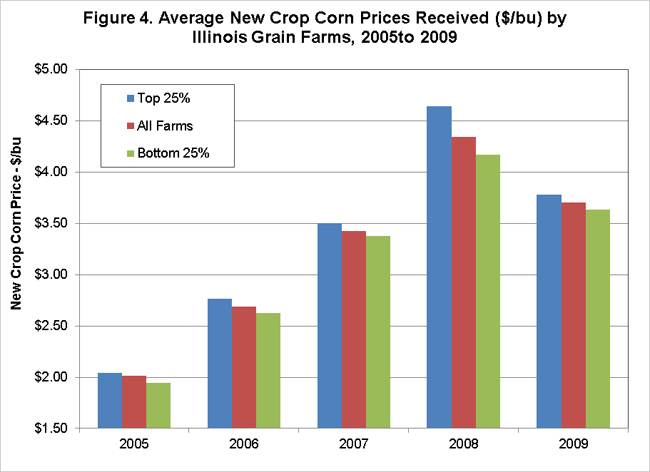 Farms in the top return quartile each year received anywhere from a $0.10/bu (2005) to $0.47/bu (2008) higher price for new crop corn. 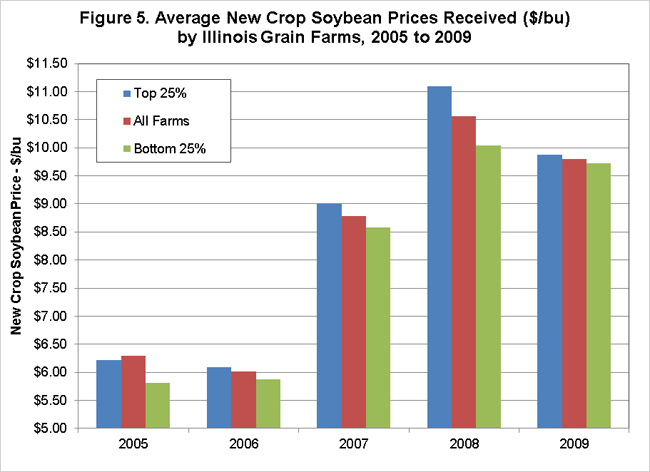 The difference in average soybean price received ranged from $0.15/bu in 2009 to $1.06/bu in 2008. The average difference in prices across all five years was $0.20/bu for corn and $0.45/bu for soybeans. In percentage terms, the difference in corn price received between the top and bottom return groups ranged from 3.5% in 2007 to more than 10% in 2008. For soybeans, the percentage differences ranged from 1.5% in 2009 to nearly 10% in 2008. In summary, this series on farm performance has shown that grain farms which achieve higher yields and receive higher prices earn greater returns consistently over time and within any given crop year when examining the 2005 to 2009 period. On the cost side, farms earning higher returns also have lower costs of production, and there is a wider gap in power costs between the top and bottom performance groups compared to direct input costs. In terms of farm size and tenure position, larger operations with more total acres and fewer acres rented under fixed cash rent agreements are characteristics of the higher return groups. But what have these posts revealed beyond the obvious? First, at least for the data and time period analyzed, it seems to be extremely difficult for grain farms in Illinois to consistently earn returns in the top quartile even over a relatively short 5-year period. Only 3.2% of the farm operations were classified as consistent performers, earning returns in the top quartile each of the five years. Second, farm operations earning high returns tend to also achieve higher yield levels, and the yield gap tends to be larger in years with poorer overall crop yields (i.e. 2005). In the second post focusing on performance consistency (Feb 16), yield differences between the top and bottom performance groups ranged from 5 to 10% for corn and 3 to 12% for soybeans. These are comparable to the yield differences seen across the top and bottom performance groups in today’s post, with the exception of the 2005 crop year where there was more than a 20% difference in average corn yields across return groups. Finally, on the price side, the difference in corn price received between the consistent top and bottom performers was fairly negligible, while average soybean prices differed across the groups by 3 to 9%. On an annual basis, the price differences tend to be slightly more significant. For example, the difference in price received between the top and bottom quartile farms in 2008 was approximately 10% for both corn and soybeans. These results indicate what I think most commodity market analysts have known for many years – it is difficult to consistently beat the market. While grain marketing has been and will remain a vital component of farm and risk management, having the managerial abilities to achieve consistently high yields and effectively control costs are other important characteristics associated with Illinois grain farm operations which consistently earn higher financial returns than their peers.